'If you want to know them, check their titles not works' Musanda said, when we were talking about African leadership and its history and at this point, I totally agree with that statement because most of our pre and post colonialism leaders are title lovers but, due to lack of a better Greek term to categorize this type of loving, we shall fix a term and call it 'title-philia'. With the above already outlined, I would like to state that the purpose of this article is to look at some of our leaders and other famous personalities' titles that made both local and international headlines. Therefore, before I go any further on this wonderful voyage, I believe it is of great significant to understand and define the term title and according to Wikipedia a title is 'a prefix or suffix added to someone's name in certain context. It may signify either veneration, an official position or a professional or academic qualification.’ In line with the definition by Wikipedia, I believe titles serves and shows great responsibility whether inherited or earned, but on the contrary, a certain section of African leadership has weakened the integrity of titles by not understanding them and I will prove proof as we continue. First on the list is His Excellency Sheikh Professor AL haji Dr. Yahya Abdul-Azziz Jemus Junkung Nasiru Deen Babili Mansa Commander In Chief of the Armed Forces and the Chief Custodian of the Sacred Constitution of the Gambia popularly known as Yahya Jammeh. He is known for his trademark prayer beads, all white clothing and a stick and Mr. Jammeh is renowned for his claim to cure HIV/AIDS and asthma with natural herbs, maybe thats why he is called a Dr or professor, but none of his claims has been scientifically proven, therefore some if not all of his qualification if not titles, that Mr. Jammeh claims to possess are fraud and carries no weight of responsibility in reality. And for some of us who are not familiar with Mr Jammeh, he is not only famous for his titles, but the wrongs reasons such as alleged human rights abuses, restrictions to press freedom to name a few. Furthermore, I urge the readers to fasten your sitting belts and relax as we increase the speed of funny as we talk about Joseph-Desire Mobutu commonly known as Mobutu Sese Seko Kuku Ngbendu Wa Za Banga translated as ' The warrior who knows no defeat because of his endurance and inflexible will and is all powerful, leaving fire in his wake as he goes from conquest to conquest'. Outstanding title for Mobutu, but his titles had no weight because it was during his time that Zaire now Congo was moving backward economically, socially and spiritually that caused total poverty during his reign. Mobutu, was indeed a flamboyant corrupt leader of his time whose net worth was valued at US$4billion at time of death, while the majority of Congo were living in unimaginable poverty. Sad as it may seem, most of our leaders have never had a heart for the people they claim to represent and this can be observed through the expensive lifestyles and satisfying of huge appetites of personal needs and wants on taxpayers' money. 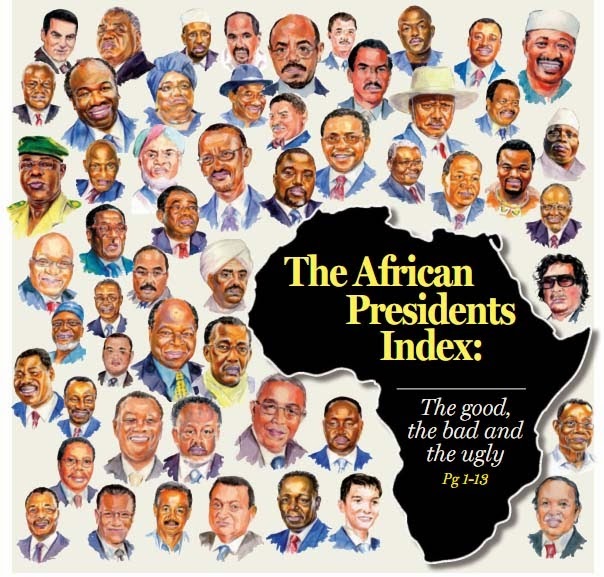 And I believe this article is incomplete without mentioning some of our leaders such as Idi Amin. Idi Amin indeed is a famous son of the continent, though he is famous for the wrong reasons. It is believed that, his kind of leadership was characterized by corruption, nepotism, political oppression, tribal persecution and economic mismanagement. Despite his brutal attitude and lack of humor, at least Idi admin was once famous for his official state claim of being the uncrowned King of Scotland even though he was an African who knew less about his beloved kingdom of Scotland and I will be considered a failure if I went ahead writing this article without mentioning his official title which is, 'His Excellency, President For Life, Field Marshal Al Hadji Doctor Idi Amin Dada, VC, DSO, MC, Lord of All the Beasts of the Earth and Fishes of the Seas and Conqueror of the British Empire in Africa in General and Uganda in Particular', a beautiful title that signifies strengthen and maturity, but Mr. Dada lacked the responsibility of his many titles. At this point, I believe titles and leadership have no connection to what legacy our leaders build and leave behind. Even if, our leaders were given titles as 'men of action', 'fly ken', 'king Kong’, ‘shorty' or even 'cabbage', I believe as weak as ‘cabbage’ may sound as a title compared to mighty King Kong, cabbage can be remembered as a champion of his generation compared to the rest with powerful titles, but less power. And its hightime to focus on a new brand of leaders that serves its people through developmental projects and scientific breakthroughes for a better Africa.